I bought this shirt for my 16 year old son. It fits true to size. I honestly like the shirt better than I thought I would. I was kind of surfing around the web for a shirt to go with his khaki shorts to wear to school. Our school colors are maroon & grey, so I thought this would kind of represent on school spirit days. Turns out, it's more of a sienna orangey-red, which looks even better on him than maroon does. It's soft and even after a couple of washings still looks great...no pilling or fading. I may even go find a Harley Davidson shirt for the hubby too! Harley-Davidson® Men's Threat Premium Short Sleeve T-Shirt - Chili Pepper, 30294391. 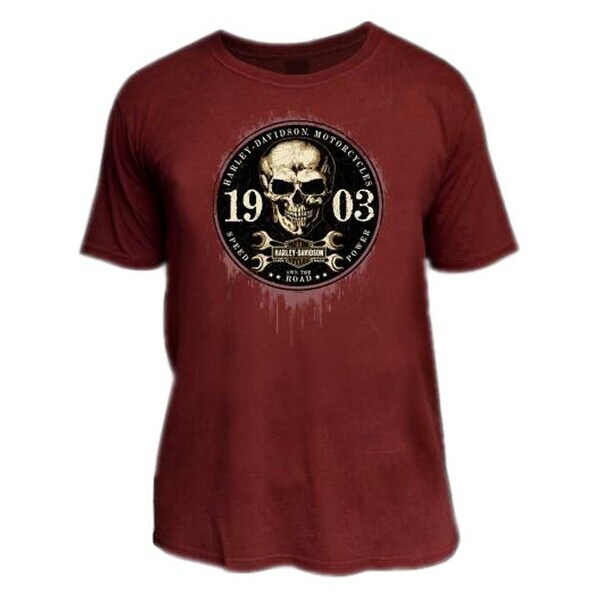 Awesome distressed custom 1903 skull graphic screen printed on front. This design uses soft-hand ink to create a unique "must have" look and feel. Back features our Wisconsin Harley-Davidson Dealer logo. Classic style, traditional comfort fit. Crew neck tee in an attractive chili pepper red wash. Extremely soft high-quality tee, made from 100% cotton. This t-shirt has it all; comfort, quality and of course style! 30294391.